The cover should really be weirder than this. Weird fiction was a genre of fiction even before there was such a thing as genre, which is really more a publishing term that tells bookstores what shelves they should put books on and gives self-published e-book authors some area of fiction that their books can excel in on Amazon.com’s many bestseller lists. The term “weird fiction” was coined by 19th century Irish writer Sheridan Le Fanu, who specialized in what we would now call mystery and horror fiction, but which were then just part of the general mainstream of literature. Weird fiction encompasses ghost stories, horror stories and just about any stories in which something unusual and distinctly creepy is going on, whether or not it has a supernatural element to it. It lent its name to one of the greatest of all early 20th century pulp magazines, Weird Tales, probably best known today for having published most of the major work of that towering master of weird fiction, H.P. Lovecraft, with whose death in 1937 the popularity of weird fiction died too, leaving it as a niche genre that only a few writers, like Robert Bloch (better known for writing the novel Psycho than for his weird fiction) and Ramsey Campbell, continued to work in. In recent years, though, the genre has undergone something of a revival, much of it in a form called the New Weird, which nobody is able to define but everybody seems to agree is what’s being written by authors like China Miéville. Jeff VanderMeer is an expert on weird fiction, having not only edited (along with his wife Ann VanderMeer) several collections of old weird and new weird fiction, but having written quite a bit of it himself, including the short story collection City of Saints and Madmen and the novel Finch. I grew up on the stories of H.P. Lovecraft and read quite a bit of the old weird fiction in my teens but have really only become aware of the renaissance in weird fiction recently, mostly from reading the introductions to Jeff and Ann VanderMeer’s anthologies (which you should read — the introductions, I mean — if you want to know more about weird fiction than I’m telling you here, though this Wikipedia article is also helpful). I had been meaning for some time to explore the newer contributions to the field and when I noticed that Jeff VanderMeer had begun a new trilogy of weird fiction novels collectively called The Southern Reach, it seemed like an ideal place to start. 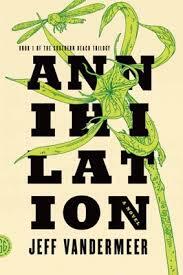 I’ve now read the first novel in the series, Annihilation — the second novel, Authority, will be published this May and the third novel, Acceptance, will be published in September — and can report that, while I’m not sure whether it belongs to the old weird fiction or to the new weird, it is unquestionably, undeniably weird. Much of the story concerns the discovery of a large hole in the ground with a staircase leading down into it, a frequent trope in Lovecraft’s work. Everybody calls this “the tunnel,” except for the narrator, who calls it “the tower,” insisting on seeing it as rising even though it’s distinctly descending. As the explorers climb down the staircase, they find phosphorescent writing on the wall relating (in English) a semicoherent narrative apparently being written by some creature that has worked its way down to an even lower level of the “tower.” Before they descend more than a short distance, the explorers decide to branch out in small parties from their base camp (which is simply the point at which they found themselves when they awoke from their hypnotic transition to Area X) and explore nearby points of interest, but gradually…well, I won’t give away any more of the plot, though VanderMeer is so obviously reluctant to make any coherent sense of this story that I’m almost hesitant to use the word “plot” to describe it. As an introduction to weird fiction, I can’t think of a better place to start than this novel. It’s short — 56,000 words, which is barely more than half the length of one of the Hunger Games novels — adeptly written and distinctly evocative of, well, weirdness. If you prefer your fiction a bit more conventional, though, you’d be better advised to avoid it, because conventional is one thing VanderMeer is very intent on not being. Posted in annihilation, book reviews, books, h.p. lovecraft, horror fiction, jeff vandermeer, reading, the new weird, the southern reach, Uncategorized, weird fiction and tagged annihilation, book reviews, books, h.p. lovecraft, horror, jeff vandermeer, reading, the new weird, the southern reach, weird fiction. Bookmark the permalink.